Sospes is a web-based app based on two things: (1) a very simple mobile interface; and (2) a back end reporting system. 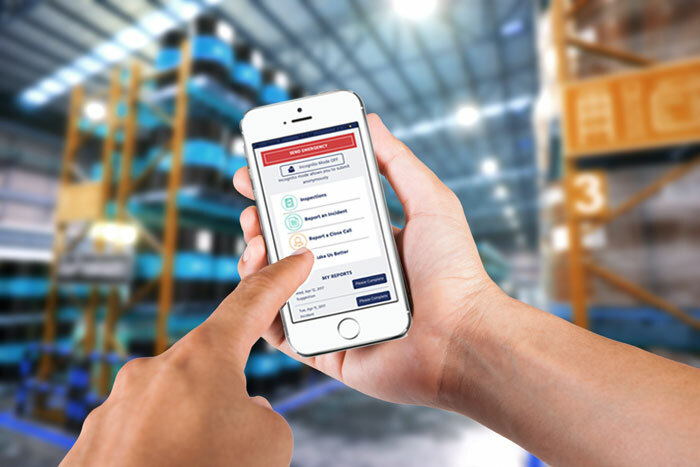 It allows workers to quickly and easily perform submit reports of close calls or safety incidents, and send observations and suggestions from anywhere. Its unique inspection module allows companies to digitize inspections (of equipment, conveyor for instance), processes or other issues. Q: What makes Sospes unique among safety software vendors? Answer: Sospes uses modern web and mobile technology to link workers at any level to their company. It’s simple to use, so workers can more easily report events that are difficult and time-consuming if they are working on paper or need to return to a computer terminal. To take it further, Sospes then collects that information and uses it to automate regulatory reporting and deliver actionable decision support to management. This lets workers report faster, but also reduces data entry and “running around” time for a safety manager. Q: Do we need special equipment to run Sospes? Answer: Nope. Just the smartphones you always carry. Sospes is hosted in Microsoft’s Azure Cloud. There is no special equipment to buy or maintain. Just the phones and tablets you already have. Sospes’ mobile app will work on any Apple or Android mobile device, typically smartphones or tablets. Its back end manager portal works on any browser and can be accessed from any computer or tablet. Q: What if I already have an inspections package? Is the system you use today easy for your employees to use? Does the system you use today create an electronic report of the results, including inspection fails and what happens to them? Can inspectors send requests from the field to people for help getting inspection fails resolved quickly? Does the system eliminate double text entry and paperwork? 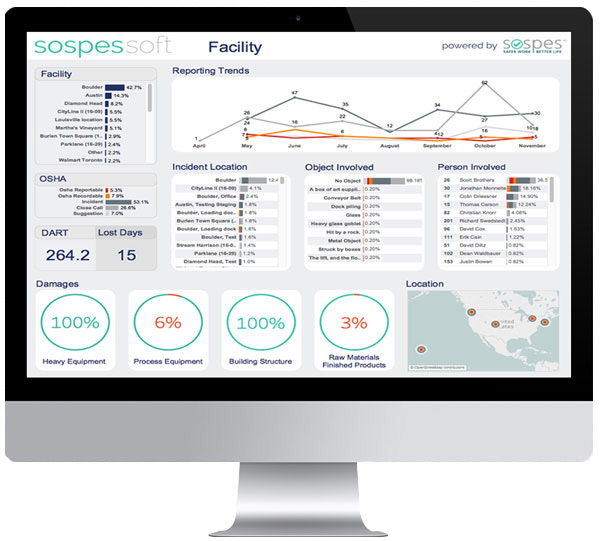 Sospes is unique in the way that it collects data from inspection results and reports patterns of inspection fail conditions to help companies understand their operating environments. Q: iAuditor provides their inspection system for free – what would we get from Sospes that makes it worth paying for? Answer: iAuditor offers a lightweight version of their product for free, but the emphasis is on lightweight. The offering comes with no support and no way to share results except by emailing completed forms. There is no data management, nor is there a way to drive task creation and management for inspection failures. For some small companies, that might suffice. Larger companies tend to find this only a marginal improvement from paper forms. Information, once gathered, should be accessible and actionable. If you can’t easily use it, why would you collect it? Q: We are already using a system for reporting incidents and close calls. What does this package bring to the table? Is the system easy to use for your employees? Do you think you are getting reports of all incidents and close calls in real time, or close to it? Some companies have trouble overcoming cultural prejudices about reporting–does your system allow anonymous reporting? Does your current system automate regulatory reporting such as that required by OSHA? These are some of the features that make Sospes a popular choice for safety professionals across many industries. Q: How do companies use Sospes “Make Us Better” reporting to truly improve? Answer: Sospes’ Make Us Better feature allows workers to easily create four special categories of reports that both inform management of issues and reinforce safety awareness across the entire workplace. By reporting both positive and risky behaviors, companies can spot patterns of behavior that can be addressed before damage occurs. Safety culture is so critical to a safer operation, and Sospes can be wired into a safety culture to support and encourage it. By reporting substandard conditions from the field, safety professionals can act quickly to remedy dangerous situations. And the ability to just make suggestions easily acknowledges that workers have great ideas. Sospes creates a way to collect those ideas for consideration by the company. Q: What makes Sospes’ analytics dashboards so valuable? Answer: Most companies collect information about operations, incidents and close calls that have occurred in their facilities, but many have no easy way to accumulate and understand that information. Sospes’ dashboard reports provides an integrated, fast way to review large amounts of data. This helps identify patterns of behaviors or even situations that have not yet resulted in problems. This lets you target actions and processes to address areas of concern before they manifest into problems. Q: What if our company doesn’t permit cell phones on the factory floor/on the job sites? Answer: We occasionally see that. You could still use the Sospes solution by placing workstations strategically around the work area with tablets for use by any worker. It’s generally best to have people use their existing devices, but that isn’t a showstopper. What if it’s too expensive for our budget? Answer: Sospes costs about the same as a cup of coffee a month per employee for a company with 1,000 employees. That is attainable to most companies, and is a good investment when it comes to prevention. Systems that encourage safety reporting, simplify administration and help you see patterns can be invaluable in reducing accidents. According to OSHA, one workplace injury costs $36,000 on average (and may cost more indirectly) so systems like this make sense from safety and financial perspectives.